Cold Spring Harbor, NY — Scientists at Cold Spring Harbor Laboratory (CSHL) and Memorial Sloan-Kettering Cancer Center have amassed strong experimental evidence implying that commonly occurring large chromosomal deletions that are seen in many cancer types contain areas harboring multiple functionally linked genes whose loss, they posit, confers a survival advantage on growing tumors. Looking closely at one large deletion—a so-called copy-number alteration or CNA on 8p, the short arm of chromosome 8—in mouse models of human liver cancer, the team validated the presence of a number of genes which normally serve to suppress the formation of tumors, and demonstrated that they act together, and not singly, to suppress tumors. The 8p deletion is commonly seen in human liver cancer and in other epithelial cancers including those of the breast, colon and lung. The research team, which was co-led by now-adjunct CSHL Professor Scott W. Lowe of Memorial Sloan-Kettering Cancer Center and CSHL Professor Michael Wigler, publishes their results online today in Proceedings of the National Academy of Sciences. 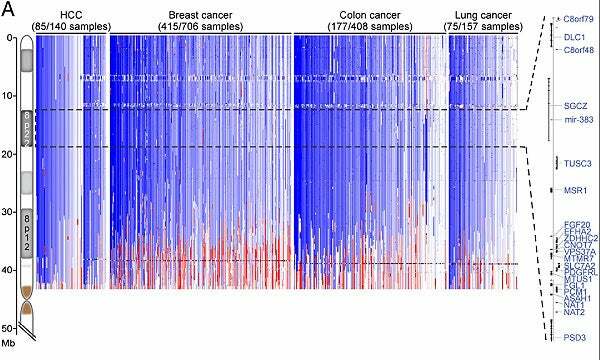 The size and extent of chromosome 8p deletions (in blue) and amplifications (in red) from individual liver (HCC), breast, colon and lung cancers, based on comparative genomic data analysis. The 8p22 region, which corresponds with the dotted lines across the readouts, contains many genes, listed on the far right. Their hypothesis about the relation between linked tumor suppressor genes in CNAs and tumor survival advantage, if validated in ongoing research, would significantly modify a popular theory of cancer genetics that has stood up since the 1970s. Called the “two-hit” hypothesis, it has helped to explain the behavior of certain cancer genes. All cancers arise from mutations in cancer genes that balance cellular proliferation and suppression of abnormal growth, resulting in out-of-control proliferation, cancer’s hallmark. Some cancers are the result of a single genetic “hit.” An example is a single point mutation in the first human oncogene ever discovered, called RAS. It results in the production of an abnormal protein that drives cells to bypass growth checkpoints. The 2-hit hypothesis was proposed to explain aspects of a childhood eye cancer called retinoblastoma. Children with the inherited disease developed the disease early—often in both eyes, whereas children who had the non-inherited, or sporadic form of the disease, developed it later and usually in one eye. It turned out that the inherited disease was caused by a recessive mutation in a single gene called RB1 but that the remaining, normal copy of the gene had to be lost in order for the disease process to begin. (We have two copies of most genes, one inherited from each parent.) The sporadic, non-inherited form of the disease required two hits of the RB1 gene, one of which was a loss of a large region containing the gene. This 2-hit model, which brilliantly explained retinoblastoma and some other cancers, “has also been used to explain what happens when all large chromosomal areas are lost in cancer—something that happens quite frequently,” notes Associate Professor Scott Powers, a CSHL geneticist and participant in the research published today. “But the theory can’t explain many of these large deletion events, for several reasons,” Powers explains. “Most important, the deleted region often does not appear to contain a ‘driver’ tumor suppressor gene [like RB1] with a point mutation that would constitute the first ‘hit.’” Lowe’s lab at CSHL used the common 8p deletion to explore in mouse models of liver cancer what might be going on. Specifically, they asked a classic question in cancer: What selective advantage does the 8p deletion provide to the tumor? In other words, when the 8p deletion occurs, how is a tumor’s development aided? What new advantage do the affected cancer cells obtain? These results “raise the possibility that large-scale genomic lesions can act through their effects on an opportunistic collection of linked genes rather than through disruption of a single resident gene,” says CSHL Professor Michael Wigler, a pioneer in cancer genetics who participated in the research. “The fact that the genes in 8p can cooperate to suppress tumor formation implies that the concomitant loss of multiple genes may create unexpected vulnerabilities not easily revealed through the study of single genes,” states Dr. Lowe. This work was supported by a program project grant from the National Cancer Institute, a Cancer Target Discovery and Development consortium grant, and the Don Monti Memorial Research Foundation. Additional support came from the Department of the Army (W81XWH04-1-0477) and the Breast Cancer Research Foundation. “A cluster of cooperating tumor-suppressor gene candidates in chromosomal deletions” appears online May 7, 2012 in Proceedings of the National Academy of Sciences. The authors are: Wen Xue, Thomas Kitzing, Stephanie Roessler, Johannes Zuber, Alexander Krasnitz, Nikolaus Schultz, Kate Revill, Susann Weissmueller, Amy R. Rappaport, Janelle Simon, Jack Zhang, Weijun Luo, James Hicks, Lars Zender, Xin Wei Wang, Scott Powers, Michael Wigler and Scott W. Lowe. The paper can be obtained online at www.pnas.org.